Canvas work embroidery is often referred to as Needlepoint, Petit Point and Bargello. Due to the woven appearance of the finished work, it is also incorrectly referred to as Tapestry. 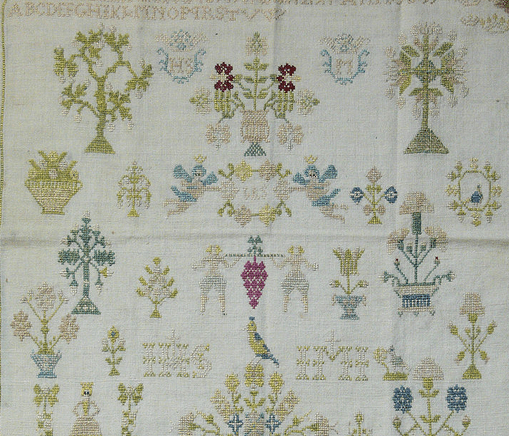 This type of embroidery is worked on open weave canvas or similar fabrics as a counted stitch style and because of it’s hard wearing nature was often used on furnishings. A variety of stitch types are used to create effect and definition. Wool yarn is the traditional favourite but it can be worked in any medium depending on the size of holes in the canvas. Aida to large holed plastic mesh. Cross stitch is also an example of canvas work.